As part of ACAN’s Latin Jazz Ensemble, Angel Cervantes plays his saxophone as Gary Meek, one of several visiting instructors from the Monterey Jazz Festival, looks on. Joshua Alfaro, Founder and CEO of the Alisal Community Arts Network, thinks big. Even the acronym provides inspiration: Alisal CAN! 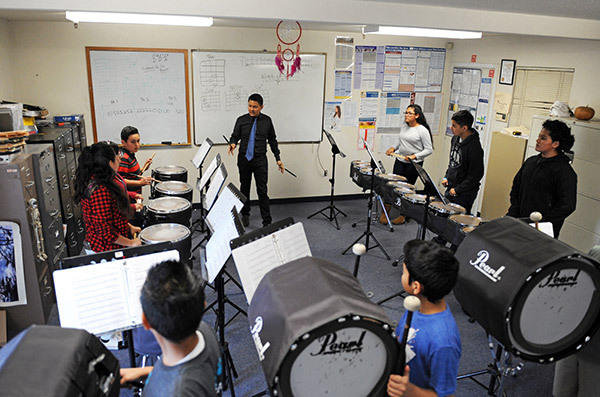 Thanks to this driven organization, also known as ACAN, morning, after-school, and Saturday music classes, plus one ensemble and a percussion section, called a drumline, thrive at each of twelve Alisal Union School District (AUSD) schools. ACAN also sponsors three performing arts ensembles: the Latin Jazz Orchestra, the Marching Winter Percussion Ensemble, the Summer Marching Band, plus piano classes. But that’s not all. Thanks to a partnership between ACAN and Community Home Improvement Systems & Planning Association (CHISPA), three town homes in Salinas enjoy free community music classes. That’s one organization connecting more than 1,500 east Salinas children to dedicated instructors teaching guitar, ukulele, hand drums, marimbas, trumpet, violin, recorder, bells, drumline, and color guard. Alfaro, 35, is a multi-instrumentalist himself. He has played in some the top drumlines in the country, and six ACAN teachers have formal experience with this specialized art. The Alisal Union School District All-Star Drumline, a marching band, is already a fixture on Main Street in most of Salinas’ many annual parades, but Alfaro is always looking for ways they can learn and grow. 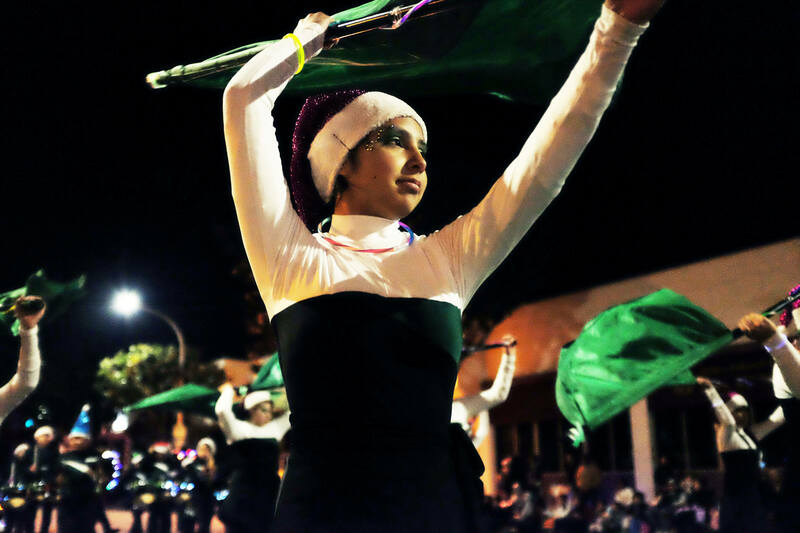 Andrea Meza performs with the Alisal Union School District’s All-Star Drumline Color Guard in the annual Holiday Parade of Lights on South Main Street in Salinas. One afternoon in the midst of his packed schedule, Alfaro steps aside to excitedly show a video on his phone of a marching band he likes. The percussion section is thundering away, as they move in perfect sync, in the middle of a college football field. In the video, portable monitors supplement the musical action in the stadium with colors and images. “Great!” he says, “See, we can do this! All we need is…” but he is called away to answer a question about Christmas lights for an event. It’s a mile-a-minute with ACAN, and the enthusiasm is infectious. Joseph Cervantes Montaño is nine years old, and he’s a student in one of ACAN’s free music classes on Tuesdays at CHISPA’s Roosevelt Townhomes. Although he’s only been playing saxophone for a month, he exudes confidence. “I want to play in a big band,” he says. Montaño also plays snare drum, and has already marched with the All-Star Drumline in the Veterans Day Parade and the Holiday Parade of Lights, and participated in a special Christmas tree-lighting presentation. His teacher Barry Capiaux, a native of Salinas, is right at home onstage. Capiaux has been all over the world with music, and wants his students, many of whom are playing an instrument for the first time, to have the same opportunities. On a Sunday afternoon in east Salinas, ACAN founder Joshua Alfaro leads instruction for the Marching Winter Percussion Ensemble, arrayed in the front office of the Alisal Center for the Fine Arts. Alfaro’s dream is to have “a jewel the community can be proud of” in the form of one or more competitive, touring marching bands. To that end, he founded the Central Coast Performance Circuit, which ACAN also supports. “Every single ensemble in the schools is competitive, and every single CHISPA group goes to the competitions we started,” Alfaro says. This approach to competition is central to ACAN’s aim to create pride and build character through contributing to a team effort. The pros from the Monterey Jazz Festival have packed up, leaving a warm glow behind after the jam session. ACAN’s Latin Jazz Orchestra takes up the slow, swinging rhythms of the piece they were practicing, and remarkably, it’s hard to notice the absence of the professionals. “It’s not just for now that we need to be doing music education, it’s for the future,” says Capiaux, with passion. 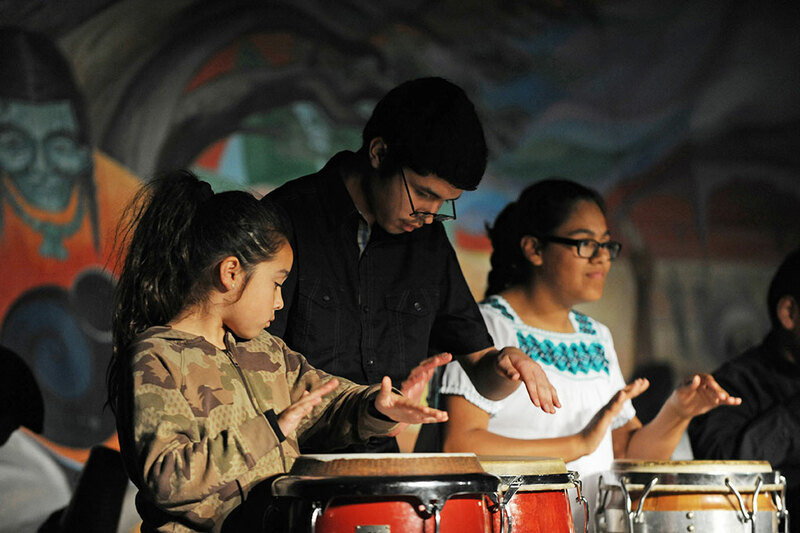 From left, ACAN percussionists Litzy Martinez, Brian Martinez, and Stephanie Morales perform during an event at the Alisal Center for the Fine Arts in East Salinas.